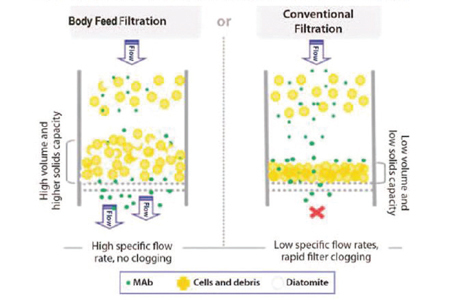 One of the major challenges in batch mammalian cell clarification is cost-effective improvement in filtration in the face of high cell densities. Single-use technology has serious benefits for flexibility in production, pilot or clinical batches, but with existing filtration equipment, the economic benefits have not been fully realized at volumes < 2,000 liters. Developers and CMOs alike require cell clarification technology that offers higher yields, fewer failures, and the ease of use of single-use, with reduced consumables costs for cost-effective drug development and production.